Nephritis is a strange kind of illness since a person can live the whole life having in his/her kidney stones and did not know about it at all. 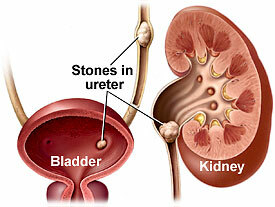 But, on the other hand such case are more likely can be seen as an exception since once the stone began the movement on ureter the stones with even small size of 3-4 mm can cause a crusial ans very severe renal colic so that non of people could stand it. The symptoms of urolithiasis depend on the size and type of stone as well as its location in the urogenital tract and the nature or origin of the violations which it is able to cause in the organs of the urogenital system. radioisotope procedure which has a medical term of “nefrostsintigrafiya” meaning in contrast to the vein is entered a special device for scanning the kidneys. That is a modern and very informative study enabling to identify renal dysfunction precisely. Well, the first place in terms of treatment means to be taken for kidney stones is necessary to stop an attack of renal colic. To be following by such stages of treatment as removal of stone, post treatment and prevention procedures of recurrence of stones in future. Currently, the ways of treatment of urolithiasis are two which are the conservative and surgical methods of treatment. The conservative method of treatment is a kind of treatment with drugs and strong diet. Such approach can be rather effective if the size of kidney stones or sand is small. Modern medicine uses drugs which reinforce the overall procedure of dissolving stones. But one has to remember that the use of these drugs is possible only under the supervision of the urologist. In cases of an inflammatory process which may occur also you have to carry out antibiotic therapy. Surgical or operative treatment is the second kind when the treatment is practically leading through the operation which removed large stones or sand inside the patient. Sometimes in clinics they use crushing stones electromagnetic waves i.e. so called extracorporeal lithotripsy. Remotely-wave lithotripsy is a powerful means which has the impact for ultrasonic flow on stones or sand in the kidneys. This method is the most preferable, as is most easily tolerated by patients. Unfortunately, to crush stones in all cases is not always possible since there is a danger of them getting stuck in urethras and cause more pain. In the absence of treatment of urolithiasis we have a risk to obtain pyelonephritis which occur in acute or chronic form – inflammatory disease of the kidneys. If you ignore to visit the urologist at this stage the process could develop into a purulent fusion of the kidneys. In this case, the kidney can be removed.